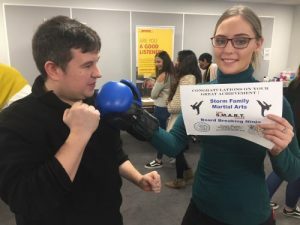 Thank you to DHL for inviting Storm Family Martial Arts in to celebrate International Women’s Day on Friday March 8th. We had a great time meeting all the staff and were made to feel very welcome. 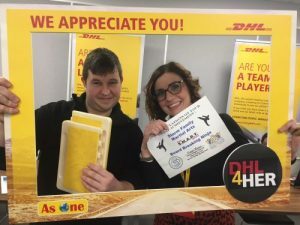 Congratulations to DHL for running such a great initiative !! On the day we had many women join us for a quick introduction to kickboxing and self defence. Then, once they had been shown the correct technique, they were able to break a board in half with a karate reverse punch !